Green chemistry is akin to baking. Both require precision and specific ingredients to produce the desired results. The trick is figuring out exactly which ingredients to use, and in what combinations. 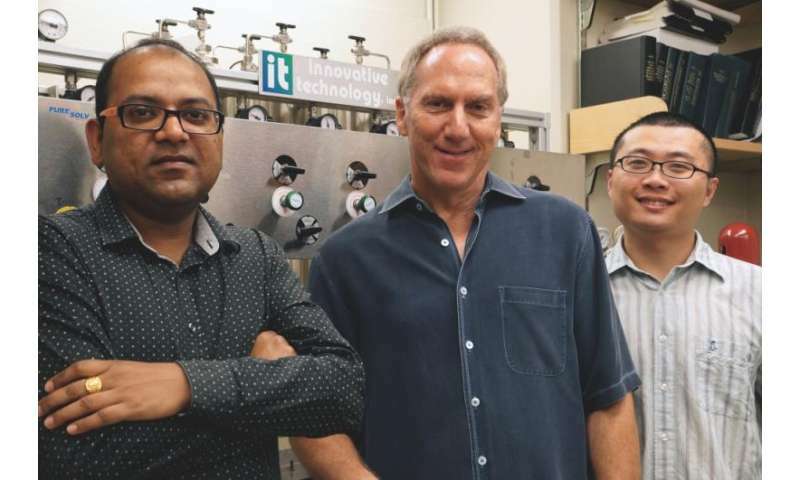 In a new paper published in the journal Science, a UC Santa Barbara organic chemistry team led by Bruce Lipshutz shows how they tweaked the recipe for an ecofriendly and less expensive version of a metal-based chemical reaction that is essential in the manufacture of several pharmaceuticals. While the researchers' green chemistry approach eliminated heat input and the need for organic solvents as a reaction medium, the reaction still required an expensive amount of the precious metal catalyst palladium. Unfortunately, palladium is one of several metallic elements considered endangered. Though the Earth contains ample amounts, it is economically feasible to mine only the limited amount that exists close to the surface. In the paper, the researchers describe a way to significantly reduce the amount of palladium necessary for what is known as the Suzuki-Miyaura cross-coupling reaction. They found that, when processed appropriately, certain sources of inexpensive, commercially available iron salt (FeCl3) naturally contain enough palladium to provide the amount necessary for the cross-coupling reaction to take place. "Our patent-pending chemistry virtually removes the normally high cost of palladium by substantially reducing the amount required for this key type of reaction," said co-author Lipshutz, a UCSB professor of chemistry who won the Environmental Protection Agency's Presidential Green Chemistry Challenge Award in 2011. "We used about 100 times less palladium than is generally needed in pharmaceutical applications. This potentially solves the problem of its endangered status—at least for many uses in organic synthesis—because the amount of available palladium should now last 100 times longer, making its ongoing use much more viable." According to Lipshutz, palladium is only one key ingredient—albeit an important one—in producing a far greener Suzuki reaction that is applicable to real-world uses. Lead author Sachin Handa and co-author Ye Wang, both visiting researchers at UCSB, tested numerous reaction variables and found that a particular combination is necessary to produce an ecofriendly reaction. "We hit upon this magic composite, but if you don't have all of the key ingredients, nothing works," Lipshutz said. "So it's not just about having palladium; it's about having the right components in the right proportions." In addition to the small amount of palladium, that magic composite includes very inexpensive iron, the proper organic solvent, a stabilizing group for the metals and a reducing agent. The method uses only water as the reaction medium. Moreover, only small amounts of a single green organic solvent are needed for extracting the final product, which means that the remaining reaction mixture can be used repeatedly. Such recycling demonstrates the sustainability of palladium as a catalyst. "Our new technology is the final step in providing a green solution for organic synthesis," Lipshutz concluded. "It eliminates organic solvents from the reaction medium, requires little to no energy input—and now, it reduces the cost and extends the lifetime of an endangered precious metal, palladium."